When you run LoginVSI load tests you want to make sure that the host has 30 seconds between each user logging on, to give it enough time to process the user logon and to not let user logons skew host resources and your VSImax results. User logons are resource intensive so when trying to generate a VSImax score it is important to ensure that user logons do not negatively influence the test. VSImax scores are calculated by creating a baseline using the first 15 logons. If the baseline is artificially high because too many logons were being processed then your VSimax score will be artificially low. Additionally if you have auto-logoff enabled it is important to leave it around the 600 seconds mark. Shown below is a 150 user test using two launchers. Each launcher is configured to launch 75 users every 60 seconds, ensuring the host only processes a user logon every 30 seconds. CPU and memory shows a uniform progression in resource usage as users are logged in over 75 minutes. This is what you want to see to ensure you generate an accurate VSImax figure. Here is the same test 150 user test, using two launchers, but each launcher is launching 75 users every 30 seconds, so the host is processing a logon every 15 seconds. CPU and memory climb rapidly as all users are logged in over 37.5 minutes. In the same time as it takes to logon all users from the test above, the test has already finished and users are already logging off under the auto log off timeout. 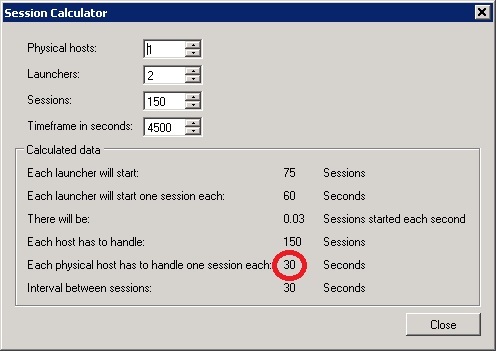 How to calculate the required session interval? When using parallel launchers, use the built in Session Calculator link in the Interval Settings section on the Test Configuration page. The difference in timeframe is shown below. Test 1 used 4500 seconds and Test 2 used 2250 seconds. The golden rule is to ensure that ‘Each physical host has to handle one session each’ every 30 seconds. Sure it will take a lot longer when running large tests but it will help to keep your results accurate and consistent.